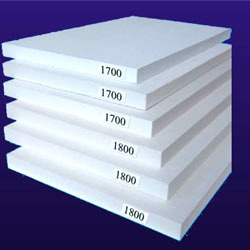 Vacuum Ceramic Fiber Boards formed ceramic board and shapes are rigid products made from Ceramic Fiber which is mixed with organic and inorganic binders with or without mineral fillers. The key feature of this Heat Insulation Board is that it contains no asbestos element but has high strength due to long resilient filament structure and binder system. This gives it very high insulating value, makes it resilient and chemical resistant. It is unaffected by water/chemical spillage and its physical properties are restored on drying. Hot face lining for furnaces & kilns. Combustion chambers of boilers & heaters. Backup insulation to castable & bricks. Ladle covers, Aluminum through lines, Trough covers, Expansion joints, Hot gas duct lining, Riser sleeves, Crucibles, Launders, Tap out cones, Sight holes etc. Type (1) Grade 1260 oC Reg. Temp. (2) Grade 1300 oC Reg. Temp. (3) Grade 1425 oC High Temp.